Cranes New York reports the Occupy Wall Street movement–or at least what remains of it–will celebrate its two-year anniversary Tuesday with rallies planned at Zuccotti Park in Lower Manhattan, Pace University and outside the United Nations. But one of the city’s biggest critics of income inequality, the man who said he would “build spaces” for Occupy protesters to hold discussions, will not be in attendance: Bill de Blasio. 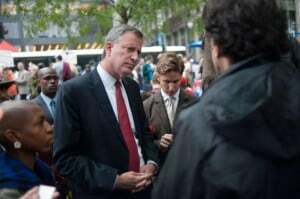 The newly anointed Democratic nominee for mayor has no plans to appear at any of the Occupy events planned for tomorrow, a campaign spokesman said, nor was he invited to attend by any of the organizers. Mr. de Blasio translated Occupy’s rallying cry of the “99%” into the campaign slogan that described New York as “a tale of two cities. But his decision to avoid Occupy Wall Street signals a subtle shift in his campaign after running a liberal primary campaign for much of the year. Mr. de Blasio was supportive of the protests, and highly critical of Mayor Michael Bloomberg’s response to the mini-encampment that sprang up in Zuccotti Park in Sept. 2011. And he has campaigned on one of the movement’s central themes: that of the 99% vs. the 1% of income earners. He has called for higher taxes on the richest residents to help fund expanded education programs. Here’s Bill de Blasio doing the infamous “mic check” during the height of OWS last year. He doesn’t want New Yorker to see this video. Bill de Blasio is a Detroit-style politician dying to do for the Big Apple, aka run it into the ground, the way Mo’Town politicos did for Detroit.